It’s always nice to see a classic like this 1969 Morris Minor being used daily. Until recently, as well as being the only car in the owner’s household it was the form of transport from Birmingham to Somerset on a regular basis. The longer trips have since been retired but for daily commuting around the Birmingham inner city roads, this moggy competes admirably. It had a full restoration about 10 years ago which has proved pivotal to its functionality. It has been well looked after with service and precautionary checks essential for its lady owner. It has been in the family for many years now and passed down the chain. Infact our customer told us all she has had in 30 years of driving is Morris Minors – This is her 3rd! But as this Morris Minor has been around so long, it truly is part of the family. We are fortunate to have possibly the most knowledgeable Morris Minor Salesman in the country. 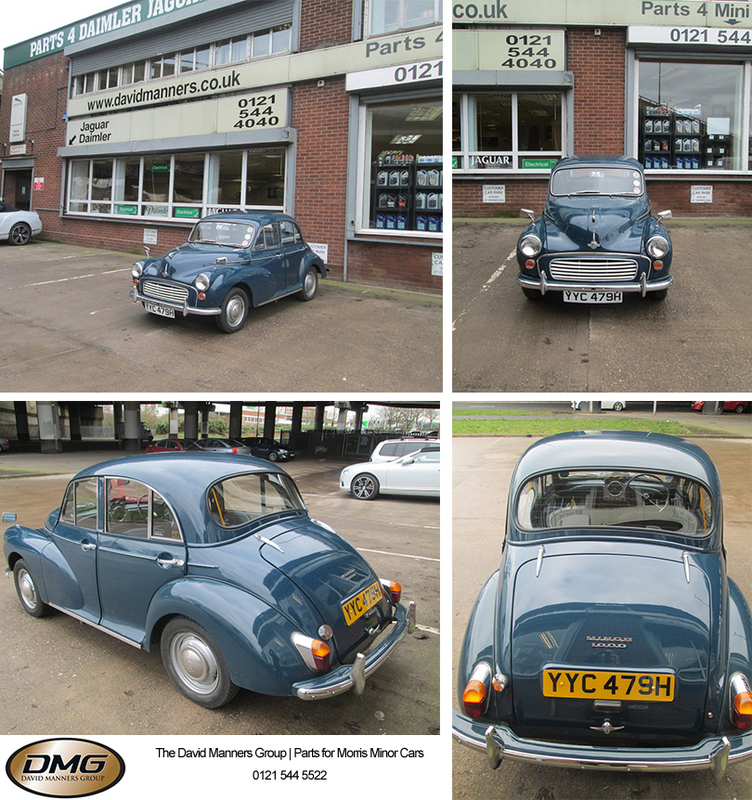 Our very own Mike Lennon used to own the Morris Minor Centre Birmingham until it became part of the David Manners Group. Mike has helped many customers make the right purchases over the years and in this case has a long standing affiliation with this car. Mike is actually featuring on a classic car restoration show in March talking about rebuilding a Morris Minor Traveller. Keep an eye on our Facebook page by clicking here for more details to be revealed soon. 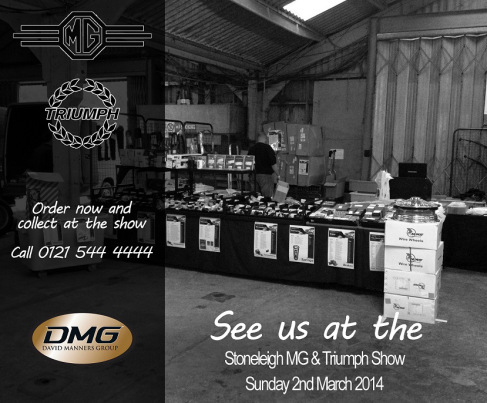 As we mentioned last week, the David Manners Group will be attending the MG & Triumph Show at Stoneleigh on Sunday 2nd March 2014. It is the first time MG & Triumph has come together in 1 show and we are looking forward to it. 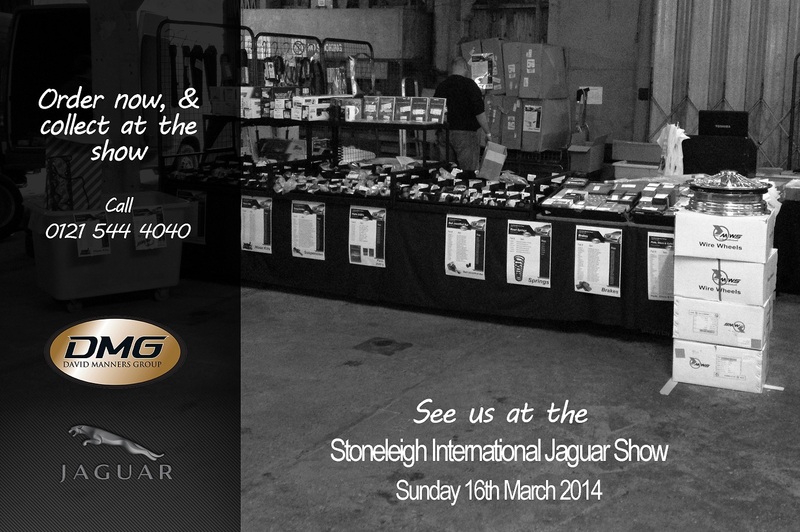 You still have until Thursday 27th February to call us on 0121 544 4444 to place your order and collect at the show. This is a very popular service and helps save you money on shipping costs. If you are attending the show, give us a call and speak to one of our expert MG & Triumph salesman today to ensure the stock is reserved. 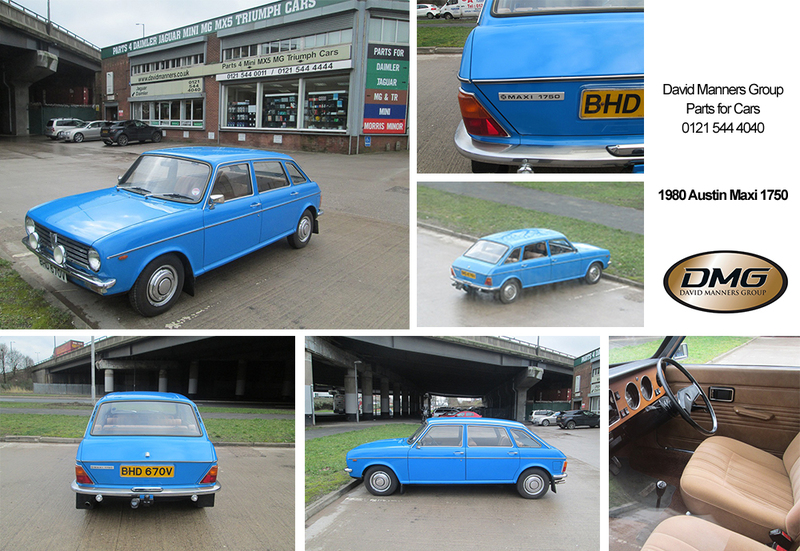 It is no surprise then that it has been kept in near immaculate condition inside and out. The interior has been kept in its original form with no replacement parts needed in its 34 years. The Pageant blue colour is striking from a distance and still in good condition when inspecting close up. It has never had a re-spray, nor does it need one but then it is no surprise when this Maxi has only covered 13,000 from new. It must be one of the few examples left with such low mileage and original factory installed parts. 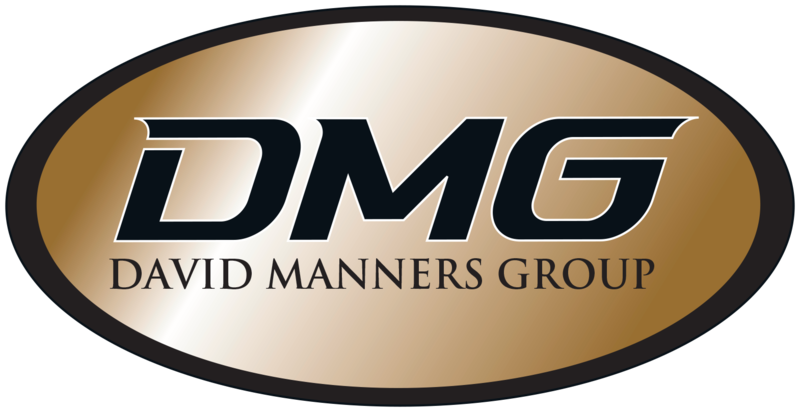 However, our customer would not be at the David Manners Group without having a few mechanical issues to address, and luckily we are able to help with hard to find parts. Before he contacted us, the owner was struggling to source various parts such as Clutch Slave Cylinder, Brake Master Cylinder and general engine components. Due to our contacts and the cars we supply parts for, many can be interchangeable (some manufacturers of classics even buy their parts off us!). The Maxi’s headlamp rim is actually the same fit of the Classic Mini for example, and so are a few of the outer body work parts. This meant we had stock readily available to take home. The owner of this Maxi also owns a 1979 Morgan and is also struggling to obtain parts including from Morgan themselves. On this occasion, we were also able to help out with stocked lines. Typically, we sell parts for Jaguar, Daimler, MG, Triumph, Mini, Morris Minor and Mazda MX-5 but we strongly encourage you to contact us if you own a Classic and are not finding it easy to get parts as we may just surprise you. We don’t know much about this project yet but we are sure this extremely rare Kingfisher Sprint will be restored to its former glory. 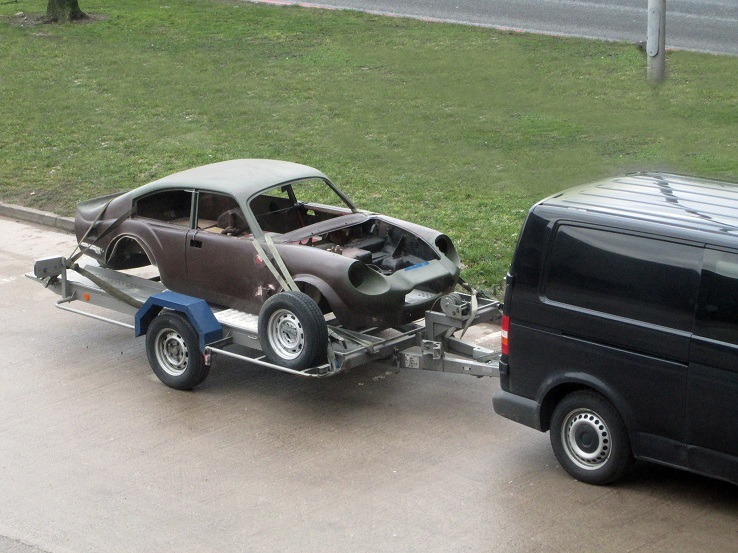 Our customer, who recently purchased the car from Scotland, drove down to Birmingham to buy some much needed parts from us to begin the restoration in Ernest before going back to his native France. It was certainly a worthwhile road trip, and one our customer has taken many times. If you are a follower of ours or have attended classic car shows in the last few years, you may have come across the name Nicolas Pinon. Nicolas is a good friend of ours at the David Manners Group and has already restored Classic Minis to concours standard with our help and won many awards along the way. The Kingfisher Sprint has a very unique history. Only 35 were built, and not all of these were completed by businessman Roger King in the 1970’s. The body of the car was changed and increased in length, with wheel arches wider added. This was joined by an air dam at the front. The rear hatch was swept up at the back to provide a spoiler. The rear window came from a Datsun 120Y while at the front the VW Beetle screen was employed. For updates on this project, check out Nicolas Pinon’s Facebook page here. This is the first installment of 2 restorations we hope to bring you undertaken by one of our local customers. 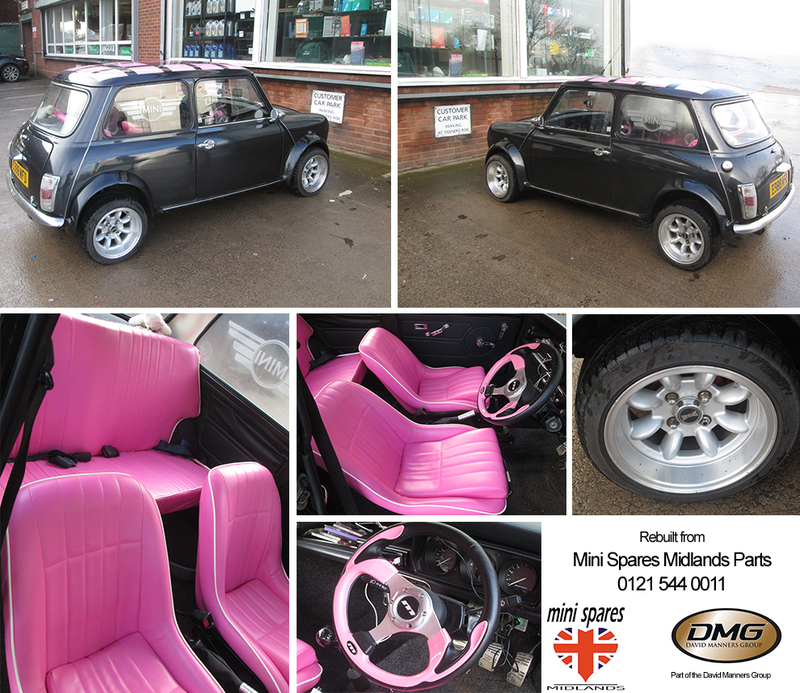 This 1988 Classic Mini has been fully restored from the ground upwards with no expense spared on top quality parts; all purchased from us at Mini Spares Midlands. Safety was a fundamental issue with this restoration as our customer had purchased a pair of Mini’s for his twin daughters. Well, you can’t leave one twin out can you? As soon as work was completed to make the car technically sound and completely roadworthy, it was then down to personalising the car to the owners taste. It was quite tricky to get full pink leather seats, pink steering wheel of a similar shade and Mini Tread Plates with a hint of…you guessed it, pink. But we helped, and it the results are stunning. Our delightful customer popped over to show us the results last week and we were delighted with what we saw. Many thanks for coming to see us and you are welcome anytime. See you at the Mini Spares Midlands Open Evening later in the year. The International Jaguar Spares Day will be on Sunday 16th March this year and we are already preparing for what is typically seen as one of the biggest days in the Jaguar calendar. Please call us on 0121 544 4040 to place your orders now. The earlier you call; we can reserve stock or order specialist items in just for you to collect. The David Manners Group will once again be at the MG & Triumph Spares show at Stoneleigh on Sunday 2nd March 2014. This is the first time that the MG & Triumph Show has come together in the great hall. This is quite exciting for enthusiasts of each model as many people own more than one classic these days and would usually have to attend two separate shows in the calendar year. The advantage for us being an MG and Triumph Specialist parts supplier is we have taken out a large area of the arena to display both MG & Triumph Parts. We are also taking back orders so you can call us now on 0121 544 4444, place your order and collect at the show.